Let’s forget for a second about video drivers, whether it has acceleration or not, and all the related issues with hardware support on Wayland. This is all solved. Let’s talk about the user interface (UI) and ways to customize it all over the computing continuum — from phones, tablets and TV box to desktop PCs, Invehicle Infotainment (IVI), aeroplane systems, among others. 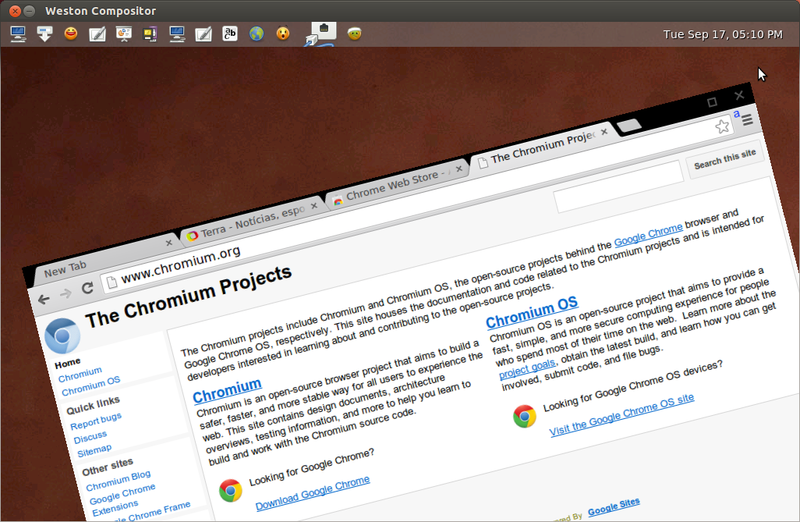 On customization, the shell plugin comes first: changes in there will impact directly which UI paradigm will be used. Specifically, one implementing the plugin protocol will be defining whether the UI is meant for phones, IVI, desktops, etc. Probably the most important characteristic of the shell plugin is to give “roles” for surfaces, i.e. define where and how they will be mapped on the screen. For example, if a client wants its surface mapped as a top-level window, or say to resize the dimensions of it, then it’s up to the shell to expose these different surfaces roles, all according the UI paradigm the shell itself is providing. Worth to note that the shell plugin doesn’t need to rely on any drawing library or graphics toolkit because it doesn’t tackle directly drawing aspects. Also, conceptually it’s mandatory to give roles for surfaces and therefore a shell plugin is a must (or at least a simple implementation of surface::configure). An special shell client through an special “private” protocol can be used for setting up basic UI elements that require special treatment. For example in the desktop UI, widget elements such as panel, dock, lockscreen and cursors will need special treatments for their positioning, grabbing semantics and so forth. On customization, different shell clients, exposing different UI elements can be implemented using *the* *same* shell plugin. Some architectures will rather be using one overlay simple client that will take care of spawning and controlling other UI basics applications also. The special client will probably want to rely on graphics toolkits. 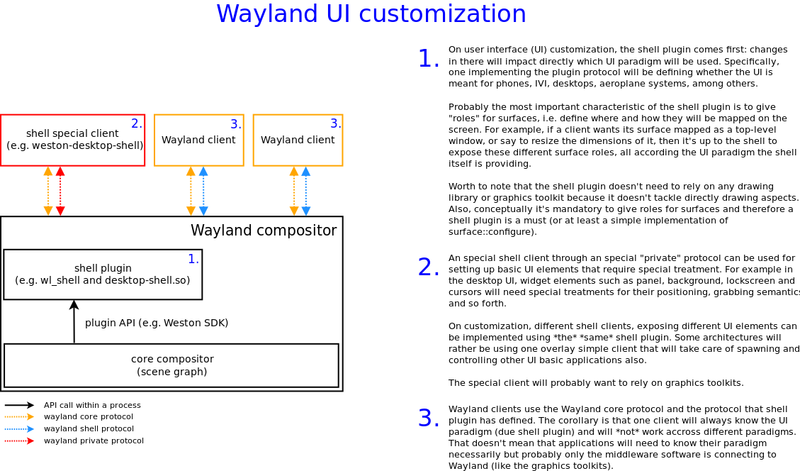 Wayland clients use the Wayland core protocol and the protocol that shell plugin has defined. The corollary is that one client will always know the UI paradigm (due shell plugin) and will *not* work across different paradigms. Though, that doesn’t mean applications will need to know their paradigm necessarily but only the middleware software is connecting to Wayland (like the graphics toolkits). First of all, there’s nothing privileged about the shell protocol Wayland is exposing. wl_shell and wl_shell_surface (the “shell protocols”) are part of the Wayland core protocol, yes, but as I’ve explained on this post, it’s all customizable for whatever UI needs. Nevertheless, their usage is completely optional and anyone can build a different shell and stack with the rest of Wayland, just like tablet-shell protocol for instance does. Still, this will be Wayland and use the shiny libwayland for IPC. Therefore I don’t think Canonical should justify their new project because Wayland “does not fulfill .. requirements completely”. There are no technical reasons Ubuntu cannot use Wayland in principle. What they wrote there is a very very mean excuse instead. Wayland 1.0 release is knocking the door and people keep asking “why Wayland if we got X already”, or things like performance, memory consumption, power savings and other kind of advantages on having Wayland instead X. Those are very important points to consider, of course, but for one individual actually programming the graphics system the answer should be straightforward: Wayland API is damn small. 1. But who’s going to program Wayland or X? Short answer is: very likely you won’t :) A more elaborated answer requires the understanding of what is the graphics system “shell” and its components, or in other words what is the system layer that fits on top of a core graphics system. While the graphics system comprises of an hardware abstraction, the shell could be thought as an abstraction for such graphics system in a way that application developers would feel more comfortable on writing their applications there – it would be the application software glue therefore, offering convenience for an ordinary developer. Examples of shell components are widget library “toolkits”, game engines, window and decoration managers, Web runtime, video processing libraries and so forth. Developers of these kind of components are the only ones that need to understand the graphics system API, in principle. 2. And what is the X API? libxcb is the implementation of X11 protocol. libxcb needs 19 functions to deal with IPC related stuff. The core protocol implementation and libxcb protocol helpers export 195 functions all together. All extensions, developed over the 25 years of X existence, sum up 26 in total with 1064 functions for clients. Therefore the X11 client API has approximately a total of 1278 entry points. Raw data and how I collected it is here. When we talk about a graphics system, we like to think about the drawing APIs only. It’s a big mistake. The API is more broad, encompassing for instance input methods, input devices, output devices, a bunch of graphics related configuration aspects, testing and so on. In fact, X has basically two drawing APIs (the core protocol and Xrender) and some systems building very modern interfaces are not even using them anymore, bypassing via OpenGLES and friends. I’ve reported about one year ago that some new systems don’t use the core X protocol and just use a few extensions instead. One would claim that this is alright cause the API would be smaller, but my opinion is if things carry on expanding outwards like they have been, we’re going get to a point where the graphics systems becomes unmaintainable. Moreover, it takes too long for the shell developer learn that just a small set of the API is needed. The X protocol flexibility feature in which developers can add many new extension as desired and the lack of a proper API deprecation mechanism is definitely a problem to consider here. 3. So what is the Wayland API then? Wayland API has approximately a total of 135 entry points, in its 0.99 version. libwayland solely exports 19 functions, where most are related with IPC, dispatching of events and etc which are the main responsibility of the library. The 14 interfaces consists of 102 functions and usually a client application will require some platform specific routines as well, such as the EGL abstraction and some for the DRM driver model; these add 14 more functions currently. We have something we call “private protocols”, that describes more high-level interactions and a few special clients. Examples are the XWayland infrastructure, desktop shell workspace and its panel bar, input methods where special care for device grab is needed and etc. One might consider adding those APIs as well but anyhow, Wayland has a small API after all. Although X and Wayland’s intention are both to sit between the applications and the kernel graphics layers, a direct comparison of those two systems is not fair on most of the cases; while X encompasses Wayland in numerous of features, Wayland has a few other advantages. 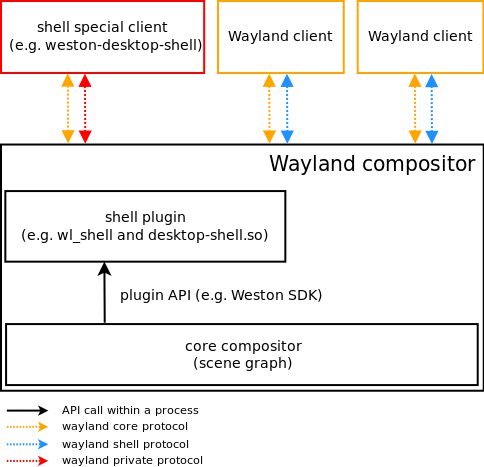 In special, in this post I wanted to call the attention for the big advantage the shell programmer has when creating components that aid modern interfaces, where only a small set of functions are actually needed using Wayland. X API is approximately 15 times bigger than the Wayland one. Here, I’ve only counted the amount of exported functions for clients. I understand that there could be different and more precise ways to tell how big is a graphics system API (e.g counting events received by clients, or Wayland amount of interface listeners, or the window properties of X). A rather cool feature on Weston compositor is xwayland, to support X11 native applications on Wayland. It’s a quite important feature because gives the compatibility with the “old” windowing system, so say you have an application written on Motif/Xt or even something more “fancy” like a Web browser all tied with GTK2 and whatever dependency, then you better not bother yourself re-writing it to native Wayland or porting to a modern toolkit — it should just work seamlessly on it. Hence, X on Wayland fits pretty well with our overall transition plan. The architecture behind and the mechanisms are a little tricky though, let’s take a look. Once Weston is started, it launches the xwayland module which creates an X socket, adds it to the main Weston loop and waits for X clients to be connected into. When the first client gets connected, it triggers Weston to fork and exec one X server. Weston continues its normal execution but unregister itself that socket. The X server, with the Wayland backend on it (xwayland), keeps listening Weston via a special Wayland protocol interface. Weston binds such interface and announces back the socket that X clients will be connecting to (xserver_send_listen_socket event) and the first X client that was just connected (xserver_send_client event). The idea is to give now to X the responsibility of clients trying to be connected, naturally. Worth to mention that this lazy initialization method was intentionally designed in order to avoid extra lags at Weston start up and memory overhead when X11 applications are not being used. So the X server is started on demand, only when actually needed. At this point now, Weston also starts its own X Window Manager. In short, the main task of it is to proxy X applications built based on those old WM standards, such as EWMH and the jurassic ICCCM, and plumb them into the shiny Wayland desktop shell interface. In other words, the idea is to map different type of X windows on Wayland surfaces (xserver_set_window_id request), and specially give some meaningful user-interface policies on X Windows to the desktop shell, for instance making a surface to get maximized, or say to resize/move it around. Other tasks the Weston X window manager performs are embed a pretty decoration frame around windows and also make sure the client-to-client communication such as copy and paste (selection) and eventually drag and drop work nicely. Remark that the X protocol doesn’t define policy but the WMs, and this is a challenge for Wayland, that does define. So the Weston X WM has to come up with the right amount of salt to fit perfectly the policies that were already straighten up by Wayland’s desktop shell… hmm way too philosophical. All X windows created from now on will be redirected to offscreen pixmap and stored on a DRM buffer (via the xwayland video driver); that’s how compositing works on Wayland. The idea is that a X client will behave very likely as a regular Wayland client. Therefore, there’s no protocol calls or any major task involved on xwayland and all happens seamlessly, with the protocol “conversion” penalty close to nil. The architecture for input handling looks good already as well. At X init time, it’s created fake devices, the keyboard and the pointer, and the concept goes the other way around of window creation: it gives the input devices capabilities from Weston to Xorg. We’re still shaping the cursor settings, the complex logic of client and surface grabbing, among other features, but the basics are most definitely in place already. So the video is there for demoing what we’ve got until now. You can see in practice all these rather cool building blocks I mentioned. It’s rather cool.. specially for developers; one has to have the know-how on X11 and Wayland protocols, Xorg and Weston internals, X Window Manager standards, etc. Lot of fun!!! Do you wanna contribute to a funky open-source project? Are you tired of your nerdy and boring community of developers? Are you the one that wants to get rid of X because it’s a giant, old and fat dinosaur in your system? :) Cool, I have a project to solve your problems! While there’s still lot of churn in the protocol, and yet our goal is soon to wrap up all we’ve been doing to a steady and settle-on-the-stone one description, there’s a lot on the implementation side that needs love. And that mainly concern Weston compositor, which is becoming the de facto compositor on several systems targeting Wayland. Back in July, I had already warmed up a discussion how we could log on Wayland. So now we spit everything to stdout but we want to do it similarly as Xorg, i.e. redirecting to its own file. It turned out that we might want only on Weston compositor and implement our own way of logging for sake of simplicity. Ideally it has to be very simple, without verbosity levels probably, etc. This task should be quite easy to finish. Weston is meant to run as a normal user. Now we have to set manually input devices, DRM and tty with root permissions, so Weston can happily be started. Ideally we should have a setuid helper script doing all this tricky, and in fact I started something here. For a real system though, we need to enhance a bit this program with the policykit, specially for dealing with hotplugs. Probably zero understanding on Wayland internals is needed but an overall knowledge of OS is required. Actually that’s not much Wayland work, but it most definitely would help its development. xkbcommon is the library that exposes the keyboard mapping logic to clients, converting keycodes in keysyms. Weston clients are using for evdev convertion. The library is an adaptation of a bunch of X11 modules to fit in a non-X11 world and as such, it still requires xproto, kbproto and libX11. One task would be to untie such dependencies with X and the other to proper merge libxkbcommon with Xorg. I’d classify as medium-size task due the involvement with the community and the hairy understanding of XKB in general, although Daniel, Kristian and other guys already made a nice progress there. 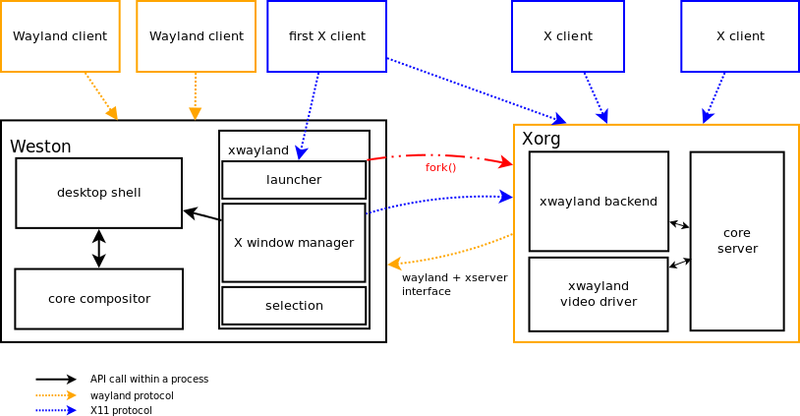 xwayland is the implementation on Xorg to make it run as a Wayland client. That works well on Intel chipsets and might work as well with other drivers through the shm X driver. In principle, basic X11 applications work with some WM control lacking, input grab as well and things like Xrandr don’t. One would also forward port xwayland and driver to upstream, once the work is shaped up. I bet WM developers would have an ecstasy and delight themselves hacking around. Hopefully you get excited with some of the items. I definitely can give a hand with any, so just poke me on #wayland at freenode.